In my day job I teach bible stories to 250 kids every week and after I tell a story to each group of twenty students we wonder about it together. I am continually amazed at how deep my students are willing to delve and what amazing insights they have to offer. I’ve read a lot of literature on children’s spiritual formation and ‘knew’ children could go this deep, but it is a different kind of knowing when you encounter it every day. 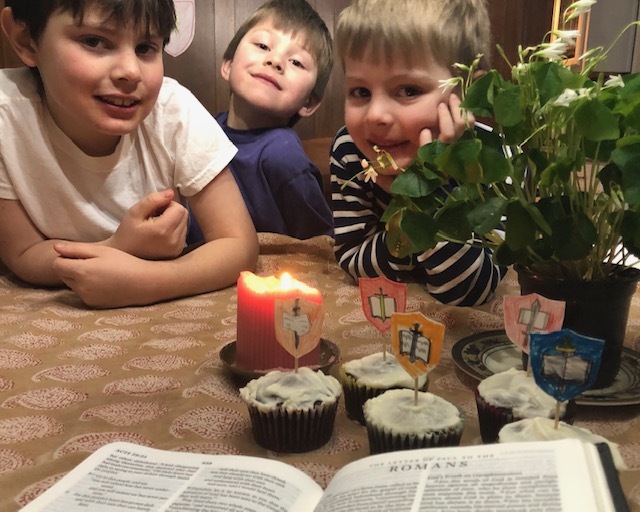 I had a similar experience as our family fell into a rhythm of reading Romans each night. I laughed at myself for being surprised at how well my own boys (4, 7, 9, and 12) interacted with the book of Romans. To be sure there were nights when eyes rolled as I grabbed the bible and afterward there wasn’t much discussion. And there were a couple tired evenings when we all asked ‘What is Paul saying?’ with glazed expressions and lacked the mental energy to puzzle it out. But most nights, the boys were happy to narrate, answer questions or give a big idea from the handful of verses we just read. My favorite nights were when longer discussions arose about ‘who are the Jews and who are the gentiles’, ‘why some people would eat meat and others wouldn’t’, and of course we had to answer the question ‘what is circumcision?,’ which took awhile. I’ve been reading a lot of the 19th century education philosopher Charlotte Mason lately. She believed that the mind is fed by living ideas. Such ideas can be found in any living book, but, she goes on to say that the bible is the living book. If this is indeed the case, then eager young minds need to be fed on it often. 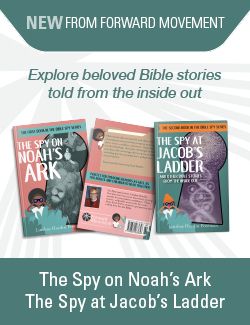 We read story bibles and passages of scripture in our home, but it was really rather remarkable to see how the boys interacted with a whole book of the bible. I think overall the experience reminded me once again to never underestimate children’s ability to understand deep and even abstract things. I was reminded what rich food the bible is for all of us. Perhaps a magic exists that could recreate the nights when discussion flowed so well while avoiding the readings and discussions that felt wanting. We might identify such nights as ‘successful’ evenings participating in The Good Book Club. In reality though, that’s not how ideas flow. I certainly have times in my own personal devotions that feel rich and other times that are mundane at best. Perhaps the magic is to simply let it flow and trust that the living word of God is working in each of us. I’m grateful that we joined in The Good Book Club this year and my goal is to encourage other families to join us next year. You have almost a year to think about it and I hope you will join us! Our eldest child, a boy, was born very prematurely and he incurred brain damage during the birth, because of the pressures on a not-yet-strong skull. He was retarded and had cerebral lalsy. Several years later, when we had three chikdren, we started family prayers after supper each night…including reading and discusssing Bible stories. My husband and I are deaf, our kids can all hear just fine, and American Sign Language is the main form of communication in our home. What really shocked my husband and me was how Terry, our eldest, multiply handicapped son, grabbed hold of the theme or moral of the Bible readings and made many very deep points about them. We told our parish priest about it, and after talking with Terry, the priest put him in the confirmation class, and later Terry asked to be an acolyte. Terry died at age 22, and we miss him enormously. He could barely read, only a few words, and we were so amazed at his grasp of Bible stories and their meanings and implications. Both of our other children are now grown and their children are adults….and so far we have one great-granddaughter. But Terry was so special, not just because of his disabilities, but for the way he used the intelligence he had, limited though it was.